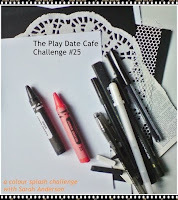 It's time for another wonderful color challenge from The Play Date Cafe! This weeks challenge is Black/White and a splash of Orange, such a striking combination. This week in the Cafe we have Kelly Marie from Lawn Fawn as our Celebrity Designer and Sponsor. I love the classic look of Black and White cards, it was fun to add just a bit of color for this weeks challenge. All stamps are from Stampin' Up! 's Friend 24-7 set. 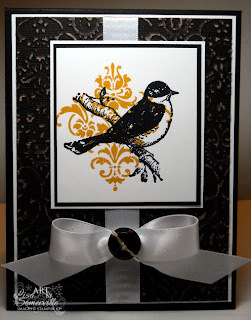 The bird was stamped in Black Archival, then I stamped the Damask in Ranger Distress Ink Wild Honey. On the Black Panel I embossed the Cuttlebug Damask folder onto Core'dinations Black Magic card stock, then lightly sanded with a DuraSand Block, to exposed the Orange color core. I used the Bow Easy to tie the beautiful White Satin Ribbon, then added a Black Button tied with hemp to the bow using a Glue Dot. Note to self, don't leave your cards with the pretty tied bows by your computer. I was in my studio earlier this week and noticed someone untied the bow. I think they just wondered if I noticed they messed with my stuff! I love your card Lisa!! It's so elegant, especially the damask behind the bird, lovely touch! Love how you stamped that bird over the beautiful damask! The pop of orange behind the black is inspired! Beautiful card. LOL about them touching your bow. I have lost entire cards to a puppy who decided to taste it and chew on it a bit. Oh my gosh! This is gorgeous! I love the way you did the splash of color! Love the classic black and white, Lisa! And the orange damask makes it even more beautiful.. Great use of the orange core CS, too!! 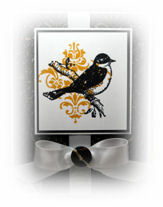 I love the way you have the damask set to the side behind the bird - a gorgeous piece of layout !! And the co-oredinations card was an inspired idea too!!! You really did bring elegance to the color splash challenge, Lisa! This is a wonderful interpretation! And a pretty bow it is, it looks perfect. This card is gorgeous! Love your card it's especially elegant looking! The bow is fabulous! The orange damask is wonderful for the splash of color!